A Large Selection of Features — All Integrated. Manage all of your groups and members from one centralized system. Our customizable platform makes it easy to answer the needs of all kinds of schools, colleges, universities or campus organizations. Once implemented at your institution, Groupment can be used by a variety of departments such as Student Life/Organizations, Admissions, Career Services, Academic Departments or Alumni Relations. Create a categorized list of all the groups in your community. Let people explore and discover new groups. Members can easily join one or several groups at once. Create multiple membership options and benefits. Collect membership payments in the currency you want. Collect more information from newly joined members. View all your members, categorized account type and tags. 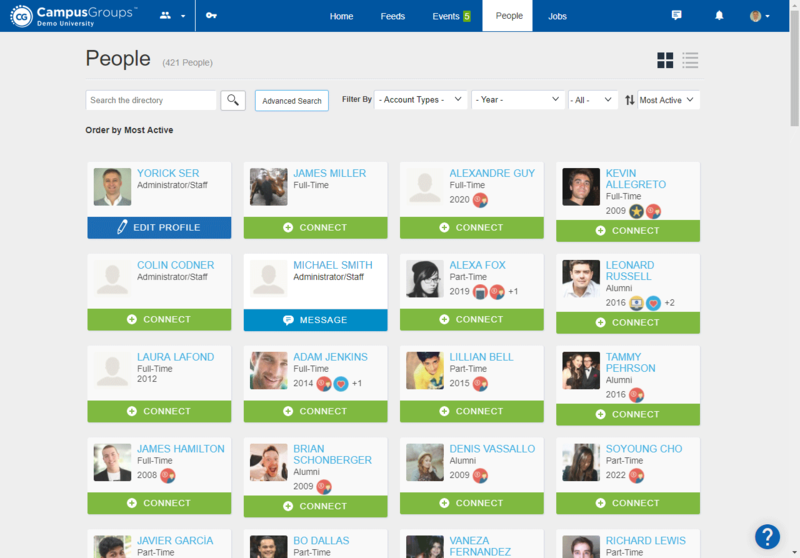 Easily search, view and manage your members. Regroup members with tags and assign specifc permissions to any group of tagged members. Add and import new members with Excel. Download members lists into Excel. Know which members are the most engaged. Customize the look/settings of your group page. List your upcoming events, officers and useful links. Give access to documents, photo albums, forms and surveys. Allow members to see other members and to connect with each other. List all your past newseletters. Maintain the list of officers for your group. Create officer positions and roles. Easily add new officers, and assign permissions and set notifications. Publish your list of officers on your Website. Easily send messages to all or some of your officers. Create sub-groups and allow members to join them. Create parent groups and associated permissions. Validate new members, or select to auto-validate. Change your group privacy settings. Automatically add certain types of users as members. Make events easy with instant web pages, scannable tickets, and automatic attendance tracking. Any group can create events following custom campus processes and with unique privacy settings. Events can be submitted for approval before they go live. All events are posted onto the campus-wide calendar, allowing for efficient planning and activity discovery. Create simple events, multi-day events with sub-events, or recurring meetings. Automatically generate a public event page for anyone to see. Make your event available on the Mobile App. Publish your event on the calendar, or make it private. List speakers, sponsors, photos and files on your event page. Allow users to download your event into their calendars. Send email invitations to all or some of your members. Promote your event on major social media channels. Post your event on your group feed or campus-wide. Create a team of organizers for your event. Collaborate with a group chat dedicated to your event. Allow attendees to contact one or all your organizers. Receive notifications about your event. Offer several registration options at different prices. Restrict access of any registration option to certain users only. Limit the number of tickets for each registration option and/or per person. Enable Waiting List which automatically activates once the capacity of a given ticket is reached. Promote people from the waiting list to the main list. Allow attendees to download or print their tickets. Decide when to open and close the registration in advance. Easily and efficiently check-in attendees at events. Works both on laptop and mobile devices. Look up attendees manually or scan their QR code. Know in real-time how many attendees have checked-in. Give tickets at the door if needed. Check attendees out and keep track of time. Mark attendees as "No Show" when they registered but did not attend. Download the list of attendees (registration information, check-in times, and more). View a campus-wide events calendar and easily find any event happening on campus. Access any event registration page in just ine click. Filter events based on groups, group types, event types, topics, your registrations, etc. Subscribe to any list of events from your Outlook, Google Calendar, iCal or any iOS calendar app. Create and save customized reports. Keep private notes on any attendee. View group specific or school-wide attendance report, to identify users who RSVP but don't attend events. Redirect attendees to a survey/questions after they register. Track the number of hours students spend at a meeting or an event. Download hours into an Excel report. Make a room reservation when creating an event. Send personalized registration confirmation, reminder and feedback request emails. Get automatic attendance data from every event with multiple convenient options for guest check-in. Track attendance at all your events from a laptop or the Groupment mobile app. Know who are your most engaged members and download reports. Easily and efficiently check-in users at events or at campus locations. Give tickets and check-in guests at the door if needed. Connect a USB Card Reader to a laptop or desktop and swipe/tap student IDs. Connect the Groupment Mobile Card Reader to an iOS or Android device and swipe cards. Allow multiple stations to swipe cards at the same time. Allow to log card swiped with no internet connection. Simple card number upload into Groupment via API or Excel uploads. Every user obtains a unique QR code when added to Groupment. Users can show their QR Code at any event to be checked-in. Event organizers can scan user QR Codes directly from the Groupment mobile app. QR Codes can also be scanned with a USB QR Code readers, connected to a latop or desktop. Users can reset their QR Code if needed. The Groupment QR Codes can match a campus generated Student ID, QR Code or Bar Code. If a user does not have their student ID or their QR code, look up the person by name and check them in. Add a user who was not previously registered to the list of attendees by simply searching by name. Event organizers can lookup name both with a laptop/desktop and with the mobile app. If you can't find a user in the list of existing users, enter your guest's information. Event organizers can print an Event QR Code and position it at the door. Users can enter the location and scan the Event QR Code themselves to self-report their attendance. The Event QR Code can also be displayed on a laptop or a mobile device at the location, and can automatically change every 30 seconds. Self Check-In can also be done at locations thanks to a laptop/desktop and a USB Card Readers. Users have to swipe each time they enter a location. This method allows a campus to measure how many users where at a given location at any time. Download a report with the list of checked-in attendees. Customize your report and include all the data you need (registration information, check-in date/time, etc). Use the Event Dashboard to see all the stats about your event's attendance tracking process. Use the platform-wide attendance tracking report to identify the users who register to events but do not show-up. Send eye-catching newsletters with our drag and drop designer, then track engagement with real-time analytics. Include invitation to Events or Surveys. Keep track of who is opening/clicking your emails, and send targeted follow-up emails. Use simple text or HTML editor to start an email from scratch. Use one of the pre-designed Groupment HTML email templates. Save your own templates and re-use them at will. Copy and paste emails from other software (Outlook, Gmail, MS Word, MailChimp, etc). Include automatically generated click boxes with links to surveys or event registration pages. Preview your email or send yourself test emails. Include your group's or your school's upcoming events. Include your officers list, photos and roles. Include a table of content with shortcut to your email's content. Include one or several photos. Include your group's social links. Select target recipients based on Account Types, Year of Graduations or Members Tags. Set the FROM email address (it could be you or your group's email address). Schedule the delivery of your emails. See who opened and clicked in your emails. See how many times an email was opened. Filter the list of recipients and resend emails. Download recipient lists into reports. Watch your email delivery status from your mobile. Use mail merge fields (i.e. First Name, Last Name, etc). Send push notifications at the same time. Send users' unique QR code by email. Send password reset links in emails. Re-use and re-send past emails. Connect with commnity members one-on-one or in a group chat for quick conversations and file-sharing. Sometimes you need a quick and efficient way to connect with event attendees, share ideas with your group, send files, or simply say hello. That's why Groupment includes robust Direct Messaging and Group Chat features to help you and your peers stay in touch. Keep your conversations going from your computer to the Groupment app, get instant notifications when chats are updated, and maintain a searchable history of all of your communications to easily recall specific moments at any time. Chat with anyone on campus on mobile and desktop. No need to exchange phone numbers to chat with another user. Share images, files, smileys and more. Search in your chat history. An email notification is sent when someone has not opened your chat messages. Hit reply to respond to an email notification. Archive discussions, turn off notifications. Add more users and create a group discussion. Unlimited number of users can be added to a group discussion. Create a group chat for new students during orientation. Stay connected to your group during field trips. Create a group chat for a class and allow questions. Administrators can create automated messages to welcome new users. Event organizers can be contacted by chat directly from the event page. Group officers can be contacted by chat by students interested in joining their groups. The organizers of an event can create a collaborative group chat in just one click. Chat with the attendees of an event you're also attending. Collect membership dues, sell event tickets, and open your online store with our secure payments platform. With Groupment, you don't need to visit a separate platform to manage your school's online payments — simply connect your payment gateway of choice to your campus community and you're all set. Whether you're processing payments for membership dues, selling event tickets, or overseeing a group's online store, take care of all of your transactions in one place. Charge membership dues when users join your group. Sell products on an online Groupment store. Users can add money to their Groupment wallet. Users can pay with all major credit card, PayPal, Venmo, checks, cash or school account. Groupment integrates with PayPal, Payflow, Stripe, Authorize.Net, CyberSource, Moneris, WePay, Braintree, NABTransact, Simplify, CashNet, PayZen and more. Money transactions flows directory to your account. Groupment can receive money on your behalf and re-distribute it via ACH, Check or PayPal Transfers. Propose multiple membership options at different prices. Each group can have one or more stores. Allow users to request refunds, and administrators to approve or deny a refund. Get Groupment to receive money for you on a central payment gateway account, and to distribute the money to all the groups. Give your group a searchable directory of members to facilitate networking and new connections. Groupment allows you to have all your constituents on one central community platform. Browse the Directory Module and quickly find anyone on campus thanks to our powerful search engine. 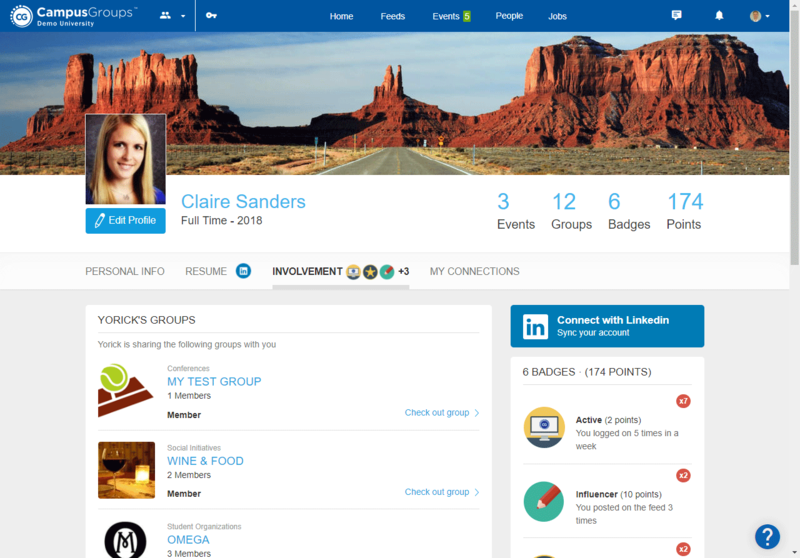 Students can build their own groups of friends, classmates, project teams, members, etc. In addition to students, staff and faculty, prospective students, alumni and recruiters can also be part of the platform if you decide so. List all users on campus. Filter list by Account Type and Year of Graduation. Advanced search capability by geographic location, industry, company name and so on. Display the groups and events that you are attending. Post photos on your profile. Update your resume and publish it on your profile. Decide which information you want to display or not. Easily import your LinkedIn resume. Display your earned badges and points. Decide which profile information you wish to share with others. Decide if you want people to know that you are a member of a group or not. Hide your groups from your profile. Hide your photos from your profile. Inspire group conversations by posting updates, photos, surveys, and more on topic-based discussion feeds. Groupment provides a private, secure and school-branded platform so that everyone on campus knows where to go to share, explore, search and stay informed. Share news, photos, documents, videos, links with your campus. 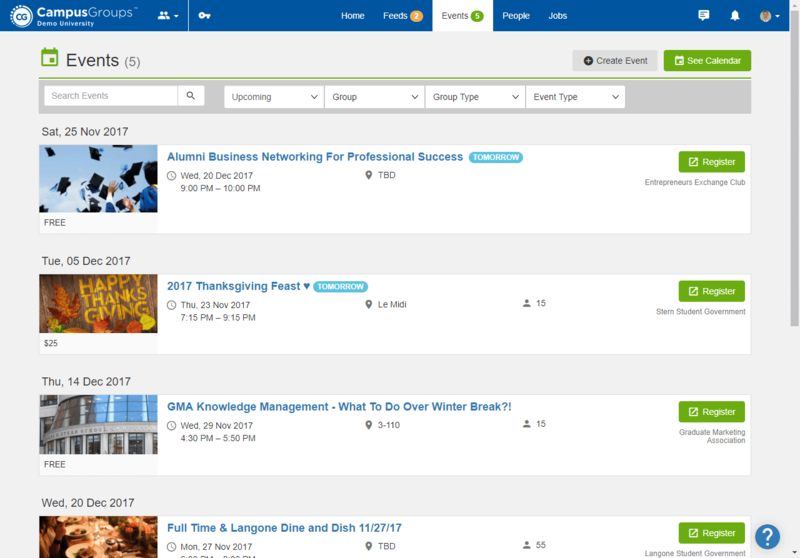 Promote your group by sharing event registration links, officer appointments, news, and more. Add privacy settings to share with just a sub-set of constituents on your campus. Share with just certain groups. Create custom feeds based on topics or interests. Allow just a sub-set of your campus to access a given topic feed. Share a given post with your social media. Like and comment, see who liked and commented. Keep your group's important files organized, secure, and accessible anywhere. Our unique Files Management feature makes it easy and simple for group leaders to share photos and documents, publicly or privately within their group. Upload documents into folders or sub-folders. Restrict access to folders to specific users (everyone, school users, some school users, group members...). Edit Word, Text, PowerPoint, Excel files straight from Groupment. Use shortened links to easily share uploaded documents or folders. Centralize your group resources all in one place, and maintain archives of documents over multiple years. Use the photo albums to create slideshows to display on a group website. Restrict access to albums to speicfic users. Create albums with photos posted by your members on your group feed. All files and photos uploade when sending emails, creating events or managing surveys can be found under your Files module. Easily move files and photos accross folders and sub-folders. Publish folders on your group page and your website. Manage your group's finances with tools for tracking revenue and expenditures, plus budget approval processes. The Finance Module offers powerful tools for group leaders to manage and keep track of their revenues, expenses, and reimbursements. We also provide a budgeting tool to allow for a campus-wide funding process. Keep track of all completed and pending payment transactions. Administrators can enter manual transactions for students to see. Import transactions from your account system and allow students to see them. Allow students to see their live balance. Create a school-wide budgeting process with customizable budget phases (submission phase, review phase, and more). Have a limited number of student leaders or administrators review and approve budget itmes. Sends notifications to students who submitted a budget request. Allow students to submit budget requests all year. Create different budget processes for different organizations. Feed expenses from school accounting system. Create a custom re-imbursment form. Create an approval workflow for re-imbursements. Promote your group online with stunning design templates and easily editable pages — no coding required. One major benefit of centralizing all group activities into one place is that groups can easily create and maintain a Website with always up-to-date data and listings of activities. We also provide interactive modules such as News and Forum. Apply a theme and customize the entire website. Add sub-pages under menu items. Add widgets which generate dynamic HTML content. Restrict access to pages and sidebars in a few clicks. Use custom CSS and JS. Track traffic with Google Analytics. Create categories and assign posts to them. Restrict access to posts to specific users. Preview your posts before publishing them. Post articles, questions or requestes or categories to specific users. Allow users to comment and like posts. Streamline your group's operations with integrated forms, surveys, and tools for holding elections. Creating Froms & Surveys is a great way to collect information from your campus community. Identity trends, ask for feedback after an event, collect mandatory information before a trip, allow groups to re-register and upload their constitutions. Add questions and select a type (text, file, ranking, and more), make them mandatory or add instructions. Assign submission open dates and times and closing dates. Send custom notifications (upon submission, when a submission is approved/denied and more). Require users to sign in and select if they can modify/view the results. Create Polls visible to all on the Home Page, or just to a speicifc group on its Group Page. Enter a question and possible answers. Restrict the access of the polls to specific users. Create a custom form to be filled out after a group officer creates an event. Review and approve events before they get published on the calendar. Message officers who submit events. Engage your attendees with a dedicated app for your event's information, agenda, and networking opportunities. Create a dedicated mobile app for a conference, a multi-day event or any large event such as orientations, tournaments and commencements. Give your attendees a dedicated space in which to socialize. Notify group members and officers of key news and updates to their group. Automatically inform students of important changes (event location change, and more). Enable or disable email, website and mobile notifications. Access your School Feed straight from your preferred mobile device. Post news or photos on the go. Easily register to events on the go. Receive a confirmation on your mobile device. Access your payments and tickets. Access the list of officers and events. Reach out to the officers. Access your tickets and inbox. Reach out to people by using the email link on their profile. Create customized analytics reports to track member engagement across all group activities. Accessing and using data is a game changer for institutions. Our Report feature makes it both easy and powerful for you to get all the information you need. A pre-set of reports is available as soon as you launch Groupment, but we also integrate customized report depending on your needs. Create a report request easily by letting us know exactly the data you need. Get your custom report the next day. Throughout the platform, you can download the data you see on your screen in a click. Take the hassle out of coordinating meetings and event locations with one-click space reservations. Groupment allows you to access all your campus from a native Mobile Application (compatible with any iPhone, iPad and Android devices). You can share on-the-go, check what is happening today, RSVP to events and conveniently retrieve your tickets at any time. Reserve a room by adding a date, time, duration, meeting title and a required number of attendees. Block the Self-Service Reservations and only allow users to request rooms when creating an event. Allow school administrators to approve or deny a room reservation. Create rooms and enter information such as capacity, number of tables, equipment, and more. Set reservation rules (prevent back-to-back, limit the number of hours someone can reserve within a given time period). Set the period of time during which a room can be booked. Block rooms or entire floors. Restrict access to certain rooms to specific users. Improve your group's performance with detailed metrics covering email engagement, event attendance, and more. One of the key objectives of Groupment is to help groups and departments collect valuable data, and help them make the most informed decisions at all times. Our Analytics Module allows administrators to easily view, download and analyze a wide range of data automatically collected. School overview of the activity on the platform. Compare with the previous year. Website Traffic, Active Users, Events, Sent Emails, Sign-Ins and Money Charts. Consult daily, weekly, monthly and yearly statistics for each group. Emails, Members, Events, Forms, Money and Website data. Student and club activity reports. Download of data stored in the platform (list of active officers, groups, events...). Synchronize your calendar and create a custom link to make meetings a breeze. Launch your online shop or open multiple storefronts under your group's name. Encourage participation from every member with badges and a leaderboard of engagement points. Foster leadership and skill-sharing with your group's built-in mentoring program. Connect your social media accounts, import member profiles, and activate single sign-on with existing platforms. We allow a wide range of interactions with other applications through Groupment. Every year, we create and improve new ways to connect user profiles with their social network. We can also work closely with the IT Departments to exchange data with other softwares that provide APIs. Allow users to use their school username and password to sign in. Connect your Facebook and Twitter accounts to synchronize your feed posts. Import your LinkedIn information into your Groupment resume. Pick a payment gateway from an existing list (Paypal, WePay, Authorize.net...). Request the integration with a new payment gateway of your choice. Redirect the payments to a school account or let groups add their own accounts.